Mako Shark is the fastest shark species in the world. Their average speed is 60 miles per hour when hunting for prey. They belong to the Mackerel Shark family and are close relative of great white shark. They have the largest brain to body ratios of all sharks. There are only two living species of these sharks that are remaining. They are called the Longfin Makos and the Shortfin Makos. These sharks prefer to live in tropical and temperate waters. They are found in the Atlantic, Pacific, and Indian Oceans along the equatorial line. 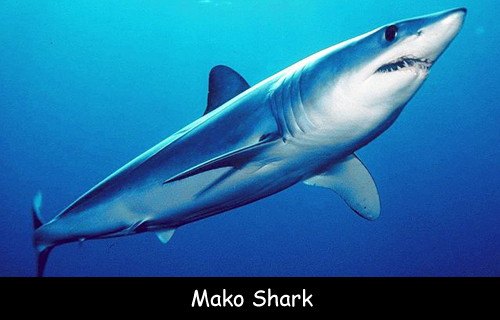 Mako Sharks have a diverse diet that includes fish, sharks, cephalopods, dolphins, seabirds, sea mammals. They can be very aggressive toward human beings and usually attack humans in self-defense. The average life span of these sharks ranges between 28 to 35 years. Males become complete adults at between 7 and 9 years of age, but females reach maturity between 18 and 21. Instead of sleeping, they have periods of inactivity where they rest and restore their energy. Their mating cycles only happen once every 1.5 years. Females have gestation periods that last eighteen months. They have a total of five gill slits that allow it to pull oxygen from the water. They have two dorsal fins and a powerful caudal fin semicircular with a highly developed lower lobe. The Shortfin Mako is one of the few shark species that is commercially viable for their meat. Declan, Tobin. " All Facts for Kids about Mako Sharks ." Easy Science for Kids, Apr 2019. Web. 21 Apr 2019. < https://easyscienceforkids.com/mako-shark/ >.